Here’s a fun piece that ran in the Daily Star Chic Magazine on the 6th of May 2017.
. 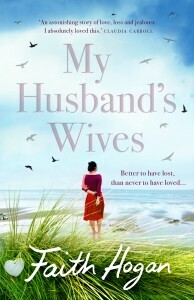 NOVELIST FAITH HOGAN HAS JUST RELEASED A FANTASTIC SUMMER READ MY HUSBANDS WIVES, ITS A ROMANTIC YET ANGSTY TALE ABOUT A HANDSOME CARDIOLOGIST WHO SUDDEN DEATH IMPACTS ON FOUR DIFFERENT WOMEN IN VERY DIFFERENT WAYS. It’s on sale now. faith shares her best of with us today…. It details some of my favorite things…. 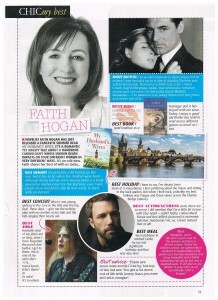 Best Book – Ivanhoe – he was my Mr Darcy – just more swashbuckling! Best Holiday – the intrepid staycationer, but we did have a very romantic time in Prague – before it became so touristy! Best Actor / Actress – aside from being a little bit in love with Cary Grant and Jimmy Steward I have a huge girl crush on Meryl Streep – she really can do no wrong. Ben Afflect is lovely too – I mean, he’s obviously very talented – right! Best Memory – Being told we were having twins will stay with me forever – Mr H was ready to burst with excitement – I was struck silent! Best Concert – It might have been The Cure way back when – it had it all on every level – but now, give me the nativity play with my mother by my side – happy days! You get a lot more with honey than you ever will with vinegar! !